MASERU, LESOTHO — Asamoah Gyan got back to the Hotel, checked into his room, and saw it. One of his bags, cut to pieces. His $10,000, gone. But his credit cards and expensive watches (running into thousands of dollars) were all on his bed, all intact. The receptionist at “The Sun” hotel in Maseru, Lesotho, where the Black Stars of Ghana were lodging, later revealed that a man had come in whilst Ghana were playing Lesotho at the Setsoto National Stadium in a World Cup qualifier on Sunday, June 16 – a match in which Gyan scored – and claimed to be Gyan, so he had been given the keys to the Captain’s room. No prizes for guessing what this mystery man – well, thief in fact, later found out on CCTV cameras – did. But Gyan will fortunately not be too worried about what happened. And this is not because he earns over 20 times more of that amount (a reported $200 000 plus a week – no tax – at Al Ain), but because he is in red-hot form for his country, and is loving every bit of the praise and recognition he’s getting. And boy, does he deserve it! After scoring 31 times in 24 games for his club in the recent season, fans clamoured for Gyan to replicate that same form on the national level – at the same time claiming he wouldn’t be able to, as the Arab league, per a wide spectrum of claims and arguments, is a ‘cheap’ league where goal scoring can become the métier of incompetent marksmen. But Gyan begged to differ. He scored twice as Ghana secured a difficult win in Omdurman against Sudan – a match that saw him reportedly equal and break legend Abedi Pele’s record haul of 33 international goals – and scored once again in Ghana’s 2-0 win against Lesotho in Maseru, a win that sent Ghana to the top of Group D of CAF’s second round of qualifiers ahead of the last Match Day against Zambia. The claim that he had broken the record was challenged, and later proved wrong – with records showing Abedi Pele had scored 19 goals that can be verified in the archives of Ghana’s International matches. The ground-breaking research, done by renowned Ghanaian football statistician and historian Thomas Freeman Yeboah, also revealed that Ghana’s true record scorer, per the records available in the archives, was Kwasi Owusu, a former striker and captain of the team, who scored 36 verified goals in just over a decade of playing for Ghana (1966 to 1977). And that is exactly what he did against Lesotho, scoring Ghana’s second goal in the 2-0 win, his 35th goal in 73 caps since making his debut in 2003. This meaning he is a goal away from shattering the ‘new’ record, and re-jumping over a raised bar. At 27 and presumably with more years of national team football ahead of him, Gyan might not only jump over this bar, he might end up setting it so high that it would take years for another to jump. Currently, the closest active player who trails him in the goal count for Ghana is Sulley Muntari, who has amassed 19 goals (6th highest scorer for Ghana, per the new findings) in 78 caps since 2002. And it is hard to see Muntari scoring 16 more goals before hanging his International boots, and even harder to imagine Gyan not extending his tally whilst Muntari is trying to do so. Gyan has come a long way. His career at national level had always been under intense – perhaps unfair – scrutiny, motivated by the effects of Ghana’s seeming inability to churn out clinical finishers. Gyan for a long time has been Ghana’s singular source of hope – and he has messed up that hope a good number of times. At AFCON 2008, hosted by Ghana, Gyan almost left the team camp, after his talent had been insulted – himself insulted even – following a bad start to the tournament. 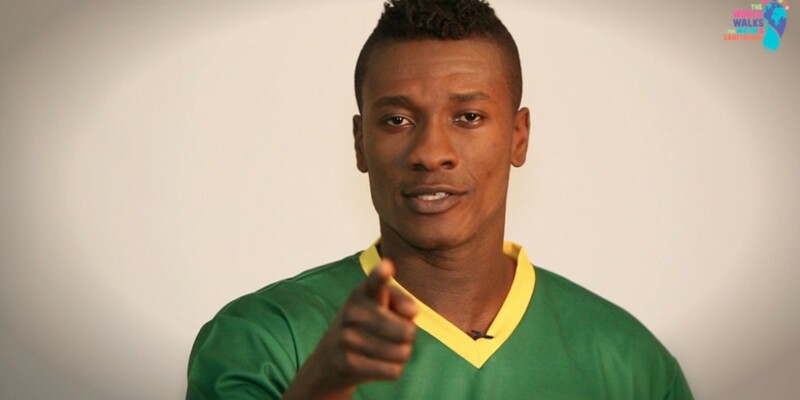 Gyan had scored 13 international goals by then, but Ghanaians couldn’t give a toss. All that mattered at that moment was just how “useless” and “hopeless” they saw Gyan to be. Gyan would later rescind his decision, returning to the squad and scoring only twice in 2009 – a brace against Japan in a friendly. Ghanaians had never really been convinced of his talent – he seemed the real McCoy anytime he scored, but then he would relapse into goal-scared mood every now and then, showing a lack of confidence in himself and around the 18 yard box, where he was supposed to be most effective. But Gyan would grow. He would learn. He would score three of Ghana’s four goals at AFCON 2010 (Angola), and three of Ghana’s five goals in the World Cup in South Africa, making it six goals out of nine goals Ghana scored in both crucial tournaments in a year. He would score in a 4-1 friendly loss against the Netherlands, making it seven goals in 2010 – his most prolific year for his country yet. Most prolific yet? Gyan just revised that last Sunday in Maseru. 2013 is barely half way through, but the “Baby Jet” has already equaled the tally of seven goals, from just 11 games. Gyan, who temporarily retired from International football after AFCON 2012, where he had missed a crucial penalty in the Semi final and had come under brutal public verbal abuse, returned from retirement only to be named captain of the team by new coach Kwesi Appiah in October. The captaincy has matured his play, and elevated his commitment – fueling a contribution so significant and never really seen in his game– as seen in how Ghana has nailed 8 wins out of 11 games he’s had the armband on. The striker is enjoying his most successful spell yet in his career –in front of goal and inside his financial books too. The dollar millionaire has scored 56 goals in two seasons at Al Ain, leading them to two league titles. His two-year tally of goals surpasses the number of goals he managed at Udinese, Rennes and Sunderland combined, that being close to eight years of football. Ghana are now in pole position to qualify for the last round of qualifying for Brazil 2014, and with a possible qualification will come Gyan’s third World Cup appearance, after scoring four goals to power Ghana to its first ever World Cup in 2006. He has scored four in this current qualifying campaign too, three in his last two games alone. The man who famously denied Africa its first ever World Cup semi final with a dramatic late penalty miss in the quarter final of the 2010 World cup (against a Suarez-hand ball inspired Uruguay) is finally coming of age. And with close to ten years of national team action – spanning two World Cup and four AFCONs – he is the second most experienced member of the current team whose average age is 23. It seems like only yesterday when Asamoah Gyan was actually a baby faced 17-year old player making his debut in a World Cup qualifier against Somalia in Accra, Ghana’s capital. He scored in that game too – a debut goal for a young striker who had dreams of becoming a legend for his country, following in the footsteps of the likes of legendary scorers Edward Acquah, Wiberforce Mfum, Osei Kofi, Kwasi Owusu, Abedi Pele and Tony Yeboah. Two goals more, and he will be forever immortalized in the pantheon of Ghana legends, mentioned in the same breath as the aforementioned players who brought immense joy and sparked pleasant awe in many Ghanaian households and stadiums across the globe. And it is frightening how he would attain legendary status without even winning a major trophy with Ghana. Gyan, after Muntari, has turned out to be the second longest serving member of Ghana’s golden generation (class of 2006). Sadly, his mother passed on to eternity in November last year. Madam Cecilia Amoako had been waiting at home with open arms when the public rage was too tough for a 23 year-old Gyan at AFCON 2008, and was also there to lend her motherly support when Ghanaians cursed her son into a temporal retirement last year. It’s sad she won’t be there to see her little boy become Ghana’s greatest ever top scorer.